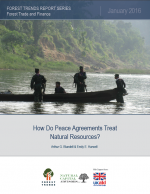 How Do Peace Agreements Treat Natural Resources? Of the 800 peace agreements signed around the globe since 1945, fewer than 15 percent address natural resources — even though those resources (oil, gas, timber, diamonds) increasingly are recognized as a major factor in armed conflicts, according to a new study by the non-profit organization Forest Trends. 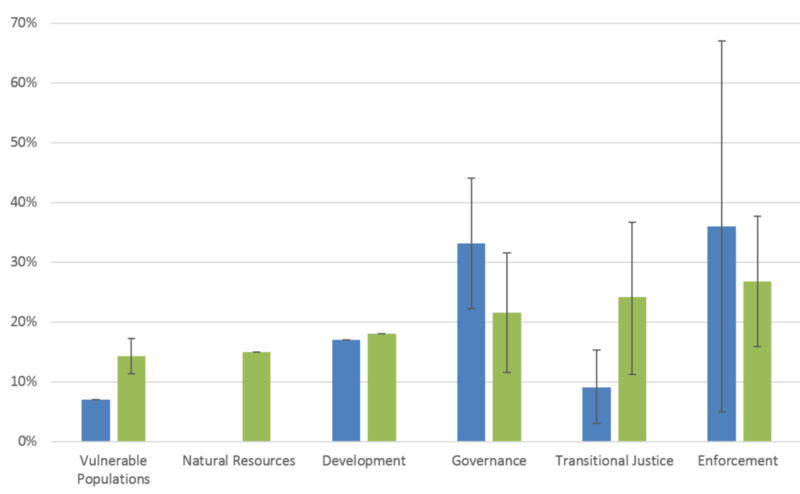 The failure to reform management of these resources could help explain why half of all peace agreements collapse within five years, according to the Forest Trends study released today and previewed in Foreign Policy. The few peace agreements that do address the management of forests, minerals and other resources have been largely ineffective, the report found. This is in large part because they do not also address the underlying grievances of local populations who are missing out on the profits the trade from these commodities. In addition, the revenues from their sales tend to fund the purchase of arms which, in turn, often leads to the escalation or resumption of armed conflicts. Each bar represents the mean for the percentage of PAs that deal with issues across six themes (see Table 1). The error bars represent the standard deviation for issues in each theme. (Blue = the Transitional Justice Peace Agreements database [640 PAs]; and green= the United Nations Peacemaker database [805 PAs]).